As we flip the calendar into 2018, is there any excitement in the wx dept for January??? I've always been told if you want to find something you want, you have to look in the right places. With that being said, I'm going to investigate some ideas of the potential of where this pattern may end up leading us into. Before I begin, I want to recap some initial thoughts and comparisons of what the climate models were showing for this winter. To recap, December has really been a bi-polar month and likely didn't really get going until about the Winter Solstice period for many of us (except MI/N WI/N MN peeps). This is the period I think we will all look back and be convinced when winter really hit. In the fall, some of the climate models suggested December to be a back and forth month leading up to a colder/stormier Jan-Mar period (which I am buying into). Thankfully, the cold and snow came during the later half of Dec instead of the opposite which leads us into January. A couple days ago, I started to sniff out modeling behavior that I felt would correct towards a pattern I have seen before. Remember the EPO corrections of the '13/'14 & '14/'15 year winters??? It's happening again and you can thank the warmer waters that are building in the NE PAC. The CFSv2 is trending towards warmth in this region ( NE PAC) which is typical in La Nina winters to produce a blocking HP in this general area. About 14 days ago, the CFSv2 had this...you can see a small tongue of cooler waters in the NE PAC but generally warmer than normal SST's. The latest run is warmer and cold tongue gone...this suggests ridging, and may be lots of it next month...with that being said, the CFSv2 has gone MUCH colder for January as a result. Gotta admit, OAX does make pretty good graphics. Here's one regarding upcoming cold and they also include some pretty encouraging CPC outlooks. Still waiting for my first inch of snow in WC. Missouri, hope to get it here soon, cold without snow is just cold lol. Fantasy GFS wants to make that CO low an ice storm here. Thankfully it's the fantasy GFS. I'd rather have cold rain than freezing rain. I think this month will have more opportunities than Dec which was primarily NW Flow and only a few chances here and there. The pattern after the brutal cold during the first week of January turns favorable for better opportunities for your region. Looks like the begging of the month looks to be cold and dry. Not much to look forward to. With so much playing out in similar fashion to 13-14, it's interesting to note that next week's potential phased system off the EC looks eerily similar to what models were portraying at this range for the Jan 5-6 2014 PV bliz. A thd started at this range for that system showed a potential triple-phased storm over New England and it wasn't until around 144 hrs that the models started showing the OHV/S Lakes hit. Hmm..would love to ride some more 13-14 parallels with this pattern! Plenty of time for this to "back into" the E Lakes..
From the morning AFD, I think somebody at GRR woke up to the stark reality that it's "pay-back time" for the past 2 mild winters! arctic piercing dagger follows this system for late next week. subzero overnight lows again possible. Quite the animated lingo for that office..
GFS seems to be quiet in the extended. Not much to look for. GFS continues to show the CO low around Day 10. Therefore, it's not gonna happen. I'm encouraged to see its ensemble members picking up on this systems potential as well as the GEFS members. This target period kick starts an active period and there should be another system on its heels a couple days later. I like the SW Flow the models are beginning to lock in on as we get past the brutal stretch during the opening 1st week of 2018. This is a remarkable achievement if this indeed does transpire. 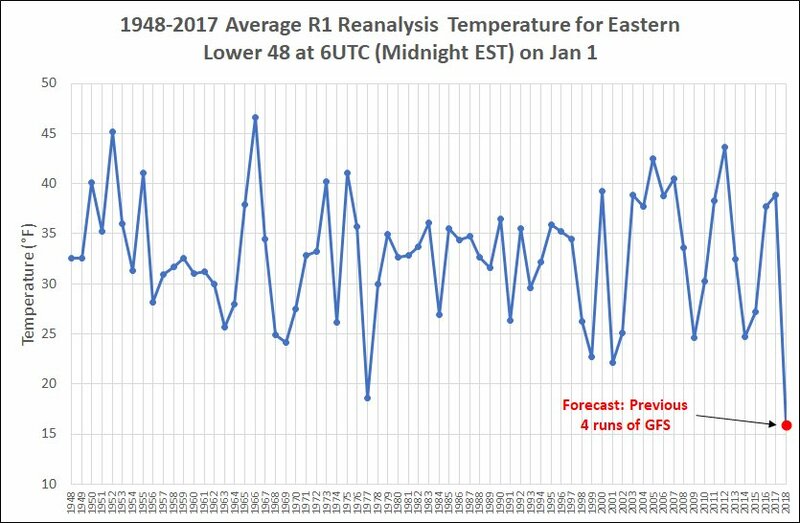 Saw this post by Ryan Maue showing the GFS is predicting for the eastern CONUS, the lowest avg temp to ring in the New Year in at least 70 years! It even beats the brutal '76-'77 NYE by 2F. The cold that is coming is down right nasty! Bigly impressive! More analog seasons at play (76-77). Where's Okwx24 been lately? Haven't seen a post from him in quite a bit.. This may have disappeared from the models, but it'd sure be nice to track something truly YUUUGE! May be wx related or not, only time will tell, lol. Today's my wedding anniversery and decided to take my wife to the upscale place downtown Kzoo. The last time we went there was for our anniversery in 2013, so I'm hoping it brings us a similar January! CFS has been showing a lot of dryness for January the last 5 daily runs. Hopefully, it's not onto something. NW flow has been dominant so far this winter and December basically never switched to southwest flow for any length of time like was originally predicted by the models, so you have to wonder if we're going to be stuck in NW flow for January too. Euro does seem to have a storm during the January 7-8th timeframe on today's model run. Anyone have maps from weatherbell? Kansas specials 10 days out tend to bode well for us. Storms that only one model is showing typically don't. The storm on 18Z GFS is a clipper. Not the CO low that we want. Took a look at the Euro weeklies from yesterday and they got colder from the last run through the 20th or so but has the ridge fighting back. It makes sense to me since the model is seeing the Alaskan ridge and the NE PAC ridge more so now than before. An interesting set of circumstances are all coming to play along with more high lat blocking that is now showing up on the GEFS/EPS ensembles. It is my opinion we have turned the corner for more of our sub forum to see colder conditions and a more active period centered around the 7th-9th of Jan that should continue through mid month. I'm encouraged to see the 12z EPS honing in on a large system around the 7th-9th target period coming out of the SW. I'll post more on this tomorrow. It will be rather quite during the first week of Jan, as is usually the case, when strong arctic HP's hit the region. Didn't we see this coming when the LRC formed back in Oct??? Pattern looks like garbage going forward. Plenty of cold but no moisture to speak of. EURO for the second day in a row is forecasting a major winter storm for our area Clint...guess who won this round with the snow..euro! LOL ok? thanks I guess. My feeling has, and will always be, that when we will look back at this winter, the Winter Solstice period is when winter came on and never let go. Even though it was a later than expected start out in the Plains, it is not showing any signs of letting go in the foreseeable future. There is a period later in Jan I'm watching for that could produce a more widespread Jan thaw but at this time I'm going to focus on the next 2 weeks. The farther east you go out towards the OV/Apps/EC there is a higher chance of the ridge to fight back and become a battle ground Week 1-2. The GEFS strat forecast are a great predictor of where the 500mb is heading in the longer range and the models latched onto to this idea earlier in the week where the busts became evident across the NE PAC/Alaska region. With all this in mind, I'll dive into the chances for tracking storms. First off, nearly all the ensembles are showing some sort of system coming out of the SW during the Jan 7th-9th period. The animation below shows the idea of a bowling ball system (west/east) storm track with a high over low pattern out near Japan. This pattern seems to be lining up across our sub forum sometime later next weekend into the early part of the following week. GEFS/EPS snow mean has been steadily increasing Day 8-10 across the central Plains/MW/GL's region so the chances of more wintry precip is on the rise and a more widespread system as well. Here is the CFSv2 take on later in January. Tom what is your take on this? Could this winter still end up like last winter? If the CFSv2 is correct it very well might. I have been paying attn to this and it's something we have to monitor as to how strong the ridging will try to come back from the south and east. The CFSv2/Euro Weeklies did a bad job for the week of the 7th-15th which will in all likelihood be colder than what they were showing just last week. I firmly believe its the N PAC pattern and the "miss" in the -EPO which was not being advertised back then. I want to wait till we get into later next week before jumping on board towards a major Jan Thaw. There was a big Bearing Sea ridge that formed around Christmas thru the 28th which suggests a big ridge to come fighting back around the 17th-18th for about 3-4 days, but this seems to be a transient period as I don't see a ridge to lock and hold. I think this is a typical CFSv2 feedback problem out in the PAC. Taking a look at the N PAC pattern, we see the Aleutian Islands being pounded by ferocius storms over the course of the next 2 weeks. 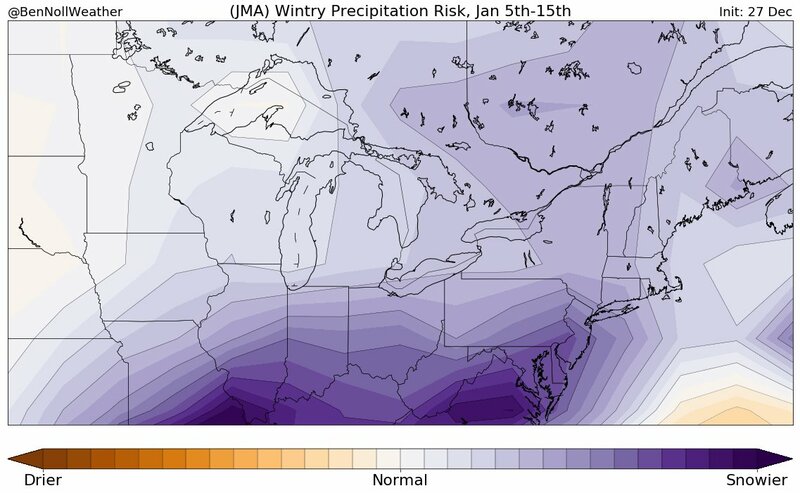 This provides us clues as to how the wx pattern may transpire for the second half of January. Namely, the period between Jan 21st - 25th could be a very large storm system to form out of the deep south and track up the S MW and has that look of it stalling out somewhere across our subforum. Look at the GEFS ensembles and the track of this deep strong low tracking towards the central Aleutian islands. I saw this storm track before in early Oct which was a great tool at predicting the late Oct GL's bomb. In fact, this storm also fits the LRC pattern when the early Dec Blitz hit the Upper MW. Interestingly, several long range predictors are over-lapping which is fascinating when you sit back and think about it. Will this happen again??? There is a lot of potential this month for some major hits, esp if the foretasted blocking transpires. Even a neutral state of the AO/NAO will do good for a lot of us on here. I'm pumped about this pattern going forward. Lastly, there is another storm right after the 7th-9th period a couple days later that may be another large one. This period, will likely tug down another brutal arctic blast as the overnight EPS/GEFS are remarkably colder across the central Plains/MW by the following weekend. GEFS strat forecasts are suggesting a cross polar flow...my money is on the cold to come surging back after our "pull back" period. Fun times ahead! So far this Winter, it has snowed when Euro said it would. Let's see how Euro does with CO lows as this is the first one it's really had this year. Let's hope Euro does as good with CO lows as it does with clippers. High over Low working out pretty good at this range...strength and placement will be interesting to track going forward. Nice to see a storm to finally track that should cover a lot of us on here. LOT met has a similar idea. Regarding the possible system toward the end of the Euro run, 00z run has it again tonight. 00z 12/29 and 12z 12/29 Euro ensembles also had quite a strong signal for a system for being that far out with multiple members showing decent low pressure centers and a surface low in the ensemble mean. Hopefully if something does develop, the continued -EPO ridging that now is appearing likely prevents a warm cutter. Looks like a dramatic rain to snow changeover. That's a classic CO low setup here. Haha, Colorado low, that's funny considering it's filled with high stoners. I'm not sure why it's initially so warm though, all of the well entrenched cold air just gets up and leaves, it would put up more of a fight than that, which would probably lend to more of mixed precip event over straight snow. Both GFS and Euro are showing that. I wonder if it'll correct itself as it gets closer. And that correction may very well include the storm disappearing. Wouldn't be the first time. It is 8 days out after all.